It’s no secret that I’m a big fan of the MB&F HM6 (see Heartbeat: Horological Machine No. 6 By MB&F). I particularly like the organic nature of the sensuously curved case and how comfortably it sits on the wrist. 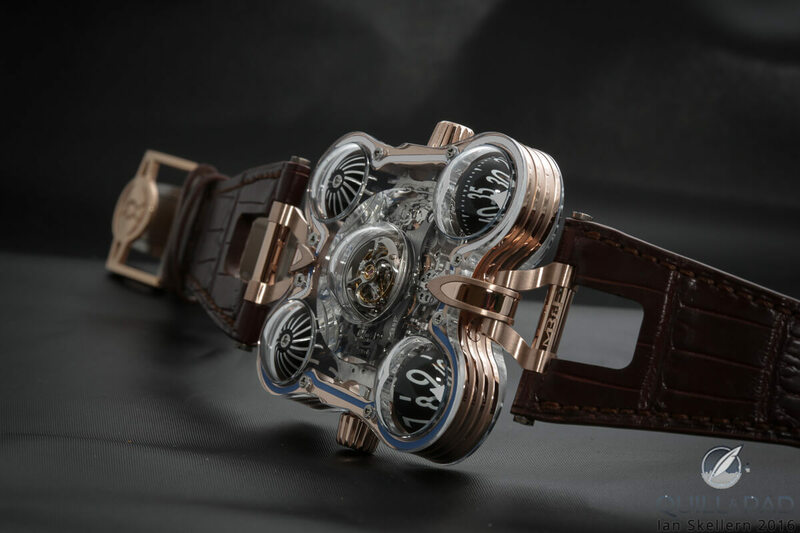 And for such a wild-looking watch, the time is surprisingly legible with those large bulbous domes, one each for displaying hours and minutes. 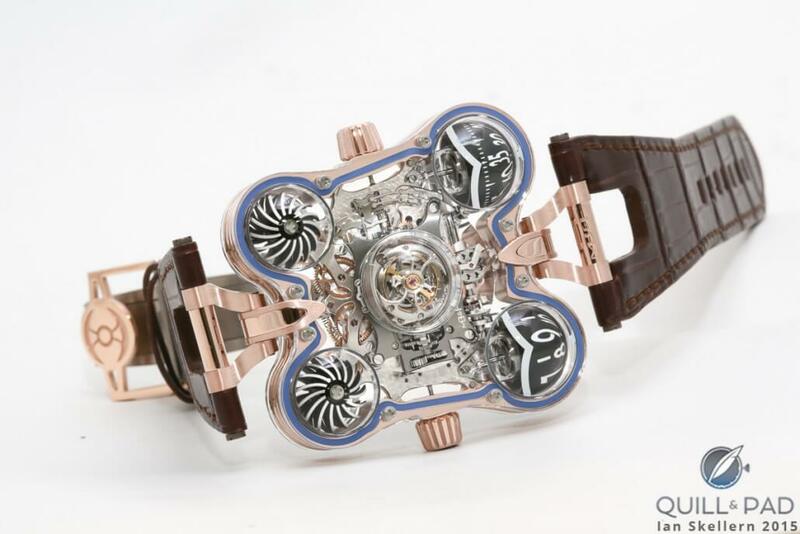 And that “winking” cover over the central flying tourbillon adds a touch of fun and interactivity to what is essentially quite a seriously complicated movement. But as much as I liked HM6, it does have a serious design issue: except for that flying tourbillon, the incredible movement is hidden under a protective titanium case. And what a pity, it’s as if only half of the watch was available to be appreciated. The case shape reflects the movement architecture, but − and admittedly like the vast majority of watches − the movement architecture is concealed by the case . . . or it was until HM6 SV came along. “I always thought that the most beautiful part of HM6 was its movement, and that it was a shame not to show it. But it was only recently that the technology of machining sapphire crystal allowed us to create such a complex case,” explained MB&F founder Maximilian Büsser. Working with large sapphire crystal cases is difficult − extremely difficult because only diamond cuts and polishes sapphire crystal − and MB&F has been a pioneer in pushing that technology to where it is today. It should also be noted that the complex sapphire crystal cases of other brands have profited from the experience MB&F has brought to sapphire crystal case producers. But with HM6 SV, MB&F has really highlighted its mastery of the sapphire crystal case. I can’t remember ever seeing a movement that scintillates so brightly from every angle. To say that it pops is an understatement. The case is a sandwich construction with two sapphire crystal plates on the top and bottom with a distinctly lined, precious metal case band between. 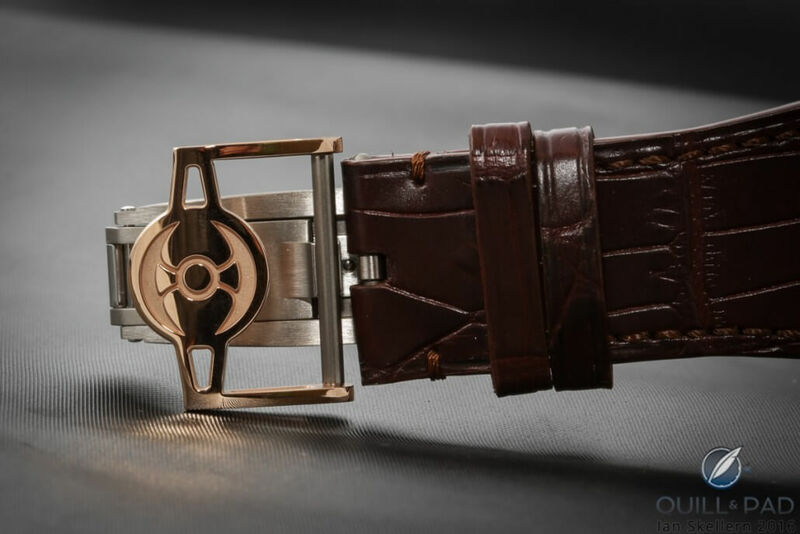 That lined central case band is inspired by a late Art Deco style known as Streamline Moderne, one example of which was the distinctive horizontal lines running along those iconic Greyhound “Streamliner” buses of the 1950s and ’60s. There are nearly 500 components (475 to be exact) making up the HM6 movement, and it looks like each and every one is visible though the sapphire case. It nearly seems a shame that the movement is automatic because it is a real pleasure to watch the gears turning as the crown is wound. With HM6 SV, MB&F has just made my favorite Horological Machine even better! For more information, please visit www.mbandf.com/hm6.